Holy smokes!" 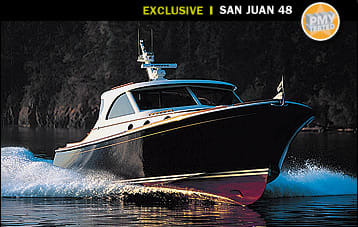 I exclaimed while pouring the coal to San Juan&apos;s new 48 Motor Yacht, a sleek, blue beauty with the styling machismo of a Maine lobster boat, the fit and finish of a jet-set Italian villa, and the engineering subtleties of a BMW 7-Series sedan. Did this baby perform or what? She was virtually leaping on plane! A grin enlivened my countenance. 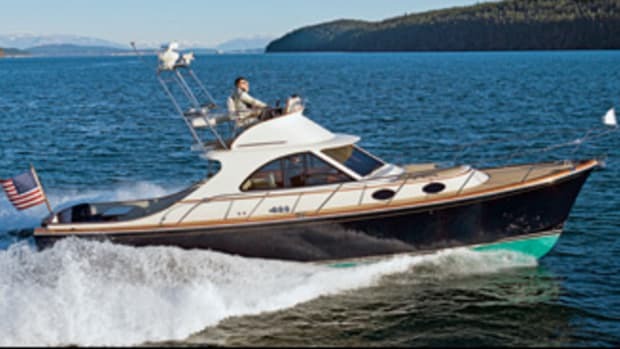 In seconds the boat was swooping across the choppy surface of Fidalgo Bay like a low-flying fighter plane, with whitecaps blurring past, picturesque Anacortes, Washington, in the background, and her Series 60 MTUs purring away like big, contented 825-hp kittens. I glanced down at the readout on the Furuno NavNet. Top speed: 45 mph or thereabouts. I could hardly believe my eyes. Already? The sense of control I enjoyed—and the tranquil ambiance at the helm—were indicative of a much gentler pace. A rousing turn seemed in order. With an index finger I rotated the destroyer-type wheel to starboard tentatively, then (quite satisfied with the result) spun it with a vengeance, ultimately carving a tight, foaming white crescent in the cold, blue waters of the bay. For the pure livin&apos; heck of it, I then carved two more hard-over crescents and a half-dozen compact figure-eights, every one a joy. Such wholehearted agility, enlivened by a constant sense of seamless solidity underfoot, was more fun than a barrel of boat-show tickets, of course, but it was also evocative of a strong, integrated approach to construction. 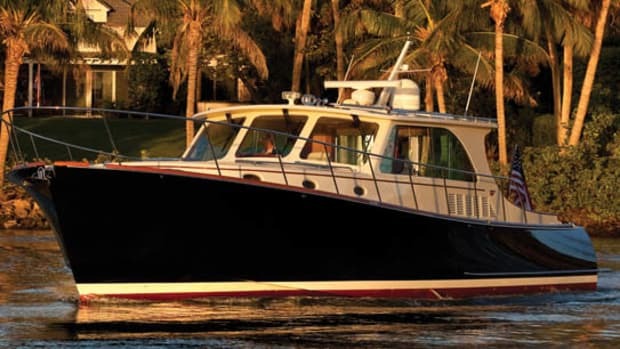 The 48 is composed of just four basic parts: hull, deck, interior liner, and superstructure. All are vacuum-infused using pricey E-glass, CoreCell coring, a high-end hybrid epoxy-vinylester resin, and in the hull alone, lots of impact-resistant Kevlar. Combine such a highly technical, lightweight assemblage into a single, unibody chunk, add four, cored-glass, watertight structural bulkheads, a PVC foam-filled E-glass stringer grid, and a box-type hull-to-deck joint, both chemically bonded and mechanically fastened, and what results is a sensation of pure, velvet-gloved brawn underway, despite the boat having a mere 32,000-pound displacement. But construction&apos;s not the entire story. 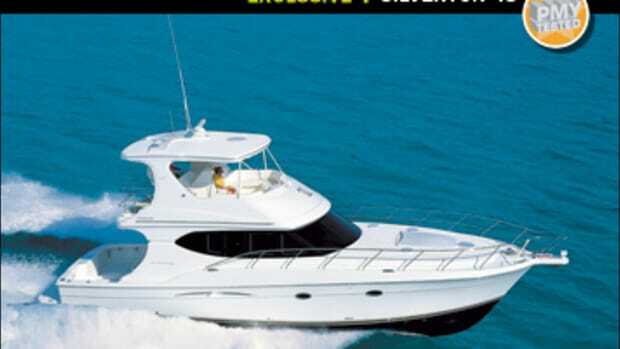 The 48&apos;s propulsion system also plays a major role in her performance. 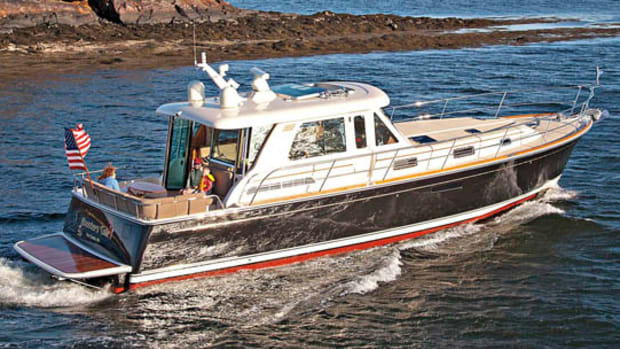 Rather than the waterjets and computerized joystick-type engine controls that hallmark boats from competing companies, San Juan opts for a straightforward approach: inboard diesels routed through close-coupled V-drives to straight shafts, with big props in tunnels and big rudders for lots of steering control, especially in following seas. Single-lever DDEC electronic sticks at the helm put the finishing touches on the package. 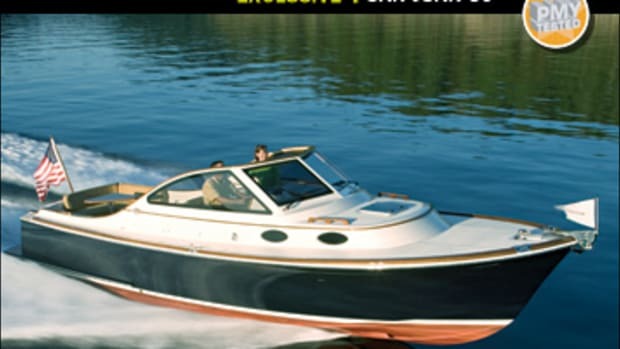 Drivetrain simplicity alone has little to do with the smoothness of the 48&apos;s open-water ride or her cornering agility, however. Instead, the key is the savvy way the system was designed, built, and installed. 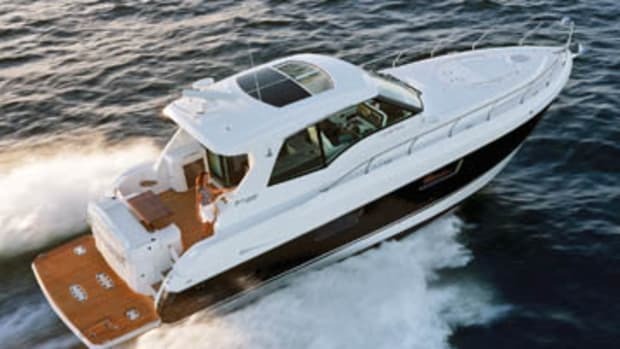 Consider, for example, the 7&apos;5" breadth between the props, as well as the rudders, a design element that boosts turning leverage and maneuvering oomph big-time. 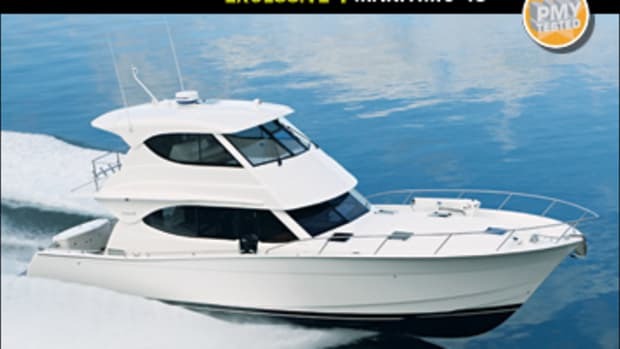 And then, not only does the boat&apos;s Marol rotary-actuated hydraulics make steering fingertip easy, the system mechanically blocks rudder chatter from the helm and obviates wheel creep, in turns as well as on the straightaway. To further enhance smoothness, rudder stocks are stabilized in gutsy stainless steel fabrications bolted into stainless steel plates that are laminated into massive hull foundations during the infusion process. And the standard-issue, computer-balanced Austral propellers on our test boat were top-shelfers. Teamed up with prop shafts hand-picked by San Juan&apos;s engineers with the reported fussiness of operating-room technicians, they helped make the ride as vibration-free as it was fast. Returning the 48 to Cap Sante Marina in Anacortes at the end of the sea trial only served to heighten my enthusiasm for the boat&apos;s handling characteristics. 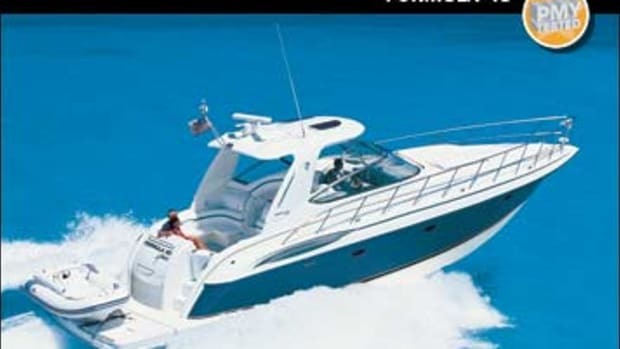 Since I was constrained to negotiate three or four narrow fairways in the marina, all interconnected by tight, sailboat-studded turns, I proceeded slowly, on engines alone, with steering wheel and rudders centered. The going was easy, nevertheless. I simply sat back in the custom helm seat, clicked the sticks with the fingers of my right hand, and watched the 48 track and pivot with Swiss-watch precision. Visibility was excellent, thanks to a huge, gray-tinted windshield and side windows. At the mouth of our slip, I energized the SidePower bow and stern thrusters just in case, a move that would prove unnecessary. By simply clutching the mains into and out of forward and reverse a few times, I docked the 48 with about as much fanfare as it takes to land a rowboat. I examined our test boat dockside in the company of San Juan&apos;s founders, Donald Campbell and Randy McCurdy. 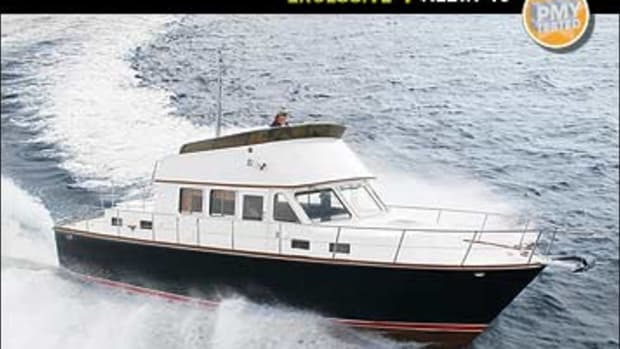 As we worked our way along, from stern to bow, the pair repeatedly stressed their commitment not only building great boats but also to offering great, 24/7 service. "There&apos;s nobody else in the business today who cares more about doing things right than we do," Campbell said at one point, smoothing a finger across a mirror-like brightwork regimen in the cockpit that boasts three coats of WEST SYSTEM epoxy and 12 coats of sprayed Stirling urethane. The San Juan&apos;s machinery spaces were masterfully done too, with standard-issue equipment in profusion. Believe me, it&apos;s not every day you come across two 22,000-Btu, chilled-water air-conditioning systems from Marine Air (either one of which will fully cool or heat the boat in case the other needs repair or maintenance), a 12-kW Northern Lights genset, a SidePower bow thruster and stern thruster, and a 600-gpd Village Marine watermaker, all on a standards list that also includes an outboard-powered Zodiac tender (with removable davit and garage stowage), full canvas package, and totally equipped galley. The 48&apos;s interior layout was as elegantly simple as everything else I&apos;d seen onboard. 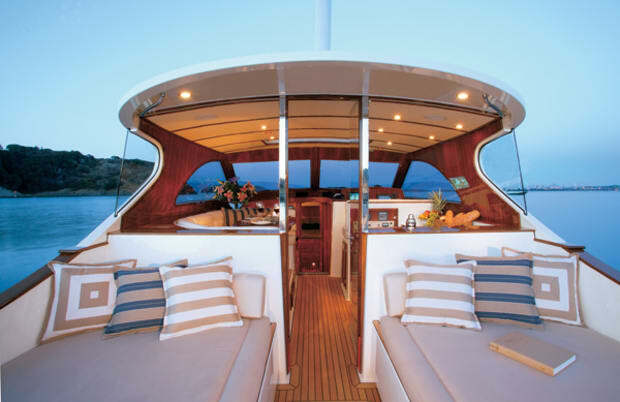 There&apos;s a full wet bar on the bridge deck abaft the helm seat, a U-shape settee and table opposite of here, wide sun lounges aft, and a benchseat across the transom. Below decks, the master stateroom is ample as well as comfortable, with a separate stall shower in the en suite head and a SeaLand "direct fall" MSD, meaning both it and the MSD in the day head across the hall open directly into the holding tank below—no macerators, sanitary runs, or other complicating factors are installed between bowl and tank. The guest stateroom, with a queen berth and fold-down pilot berth rendered private by pocket doors, is opposite the U-shape galley and is the real showpiece of the teak-trimmed accommodation area. With doors retracted and the berth converted to a couch-potato-friendly lounge strategically positioned in view of flat-screen TV, it does double duty as an entertainment area. Ican&apos;t say I was overjoyed at finishing up my test of the San Juan 48 Motor Yacht. There&apos;s something flat-out enjoyable about hanging out on and around a superbly designed, finely built vessel all day and palavering with a couple of hard-working boatbuilders like Campbell and McCurdy. I bailed out just in time, though. The boat was scheduled for a photo shoot in the morning, and there was a little salt on her from the sea trial. "Most folks&apos;d say she&apos;s pretty clean right now," McCurdy grinned, plying a soapy sponge with characteristic fervor in the dying Pacific Northwestern sunlight. "But she&apos;s filthy by our standards," added Campbell, who was just as passionately addressing a faint footprint located on the San Juan&apos;s cabin top with a deck brush. I wouldn&apos;t doubt they were hard at it &apos;til midnight.